All Replies on Aligning my Grizzly GO555 cast iron table? Aligning my Grizzly GO555 cast iron table? hey Tom… I had the same issue with my bandsaw a while back where the miter gague would bind on the back end of the table. I got my best adjustment/alignment by placing a extra miter bar guide in the bandsaw track and clamping it in the track after I had loosened the adjustment bolts. Having the miter bar clamped into the track nice and tight allowed me to get the table top sections aligned with more precision and it is still working smoothly. Thanks! Where you been dude? Not much social media on you. I did use a straight edge. My bandsaw miter gauge is pretty flimsy, but my table saw gauge is the real thing. Tom I have the same saw only the P series but the same, I’m having a hard time understanding what your problem is? Do you have both knobs tight as possible? Do you have the rear stop bolt adjusted properly? Also an investment in the digital angle reader Wixey would be a great help that is what I use. Thanks for asking and throwing out some questions I believe I did all you asked, and I will recheck it. The miter gauge gets stopped against a slight difference in the back. As I mentioned to Greg I used a good straight edge too. Alignment appears OK as I successfully sliced some fairly thin Black Walnut veneer which was equal in dimension from beginning to end cutting. Just wondering if you checked the flatness of the table close to the miter slot, with feeler gauges with the straight edge, if it shows a slight change in height past the blade slot? Is the contact to your miter bar just on the bottom and not at the sides? If it is just the bottom or slightly on one side, use a fine sandpaper glued or PSA to a flat oak stick that fits clean flat with the paper thickness added into the miter slot and just touch it lightly across the high area in the miter slot. use perm- marker will help show the high spot the sanding will cut, so to focus your sanding in the correct spot, not the full length, just the transition area. 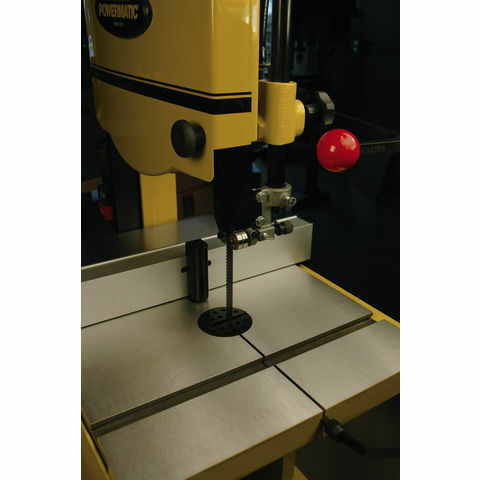 a few thousandths is all it takes to bind on the miter bar. after the clean up, wax it good. From there it should stay. Green/ grey cast Iron will move as it ages, that is how the Hand Planes change over decades. Thanks for the suggestion. I will take all of the great advice and apply as a “Rule out” on my next go round with the saw. I would go with the easy solution and bevel the edges of the miter gauge and slot so that it can align itself without catching. It shouldn’t need much bevel but I would make them shallow angles so the inclined plane has good mechanical advantage. You said that the alignment pin is there but was it ever left out for any length of time? I have read that if you leave the pin out of the blade slot for a while, it is very likely that the table will lose its alignment. Did you try tapping the pin in farther to see if that helps? If you put a straight edge across the blade slot, can you see a difference or slide a piece of paper or a feeler gauge under one side? If this were Jeopardy you would be almost right. loosened up everything and ran the miter gauges through again noting carefully where the catching was happening. The slides on both my gauges do’t hit the bottom of the groove. The table saw miter gauge has a much longer slide. Therefore more stable in changing plane from one side to the other. Did a “what if?” and removed the pin and then used a 6 inch F clamp at the slit between the two sides with a lot of pressure. Then aligned the table with the blade, tighten the trunions and brought the leveling bolt up flush to the table and re inserted the pin. ... and brought the leveling bolt up flush to the table and re inserted the pin. How far in does the alignment pin go? Is it up flush against the table or could it go in a little more if tapped in? Just wondering if you’ve got the right pin for this saw or it is worn or something? The pin has a hex head on it. it was in tight. no play and it is in tight now. What Grizzly saw do you have? I have the G0513 17”. One thing that I have noticed on mine is that the alignment is actually worse if I tape the alignment pin in too far. Probably a sign of less than perfect manufacturing? Is your GO513 the anniversary edition or the extreme edition? Anniversary edition. I was originally going to get the 555 but they had a sale on the 513ANN that made it less expensive than the 555 extreme with the riser so I decided to get the bigger one instead. No complaints. I have been eyeing the 17 inch saws and there differences. Did you spend the extra for the cast iron trunion? 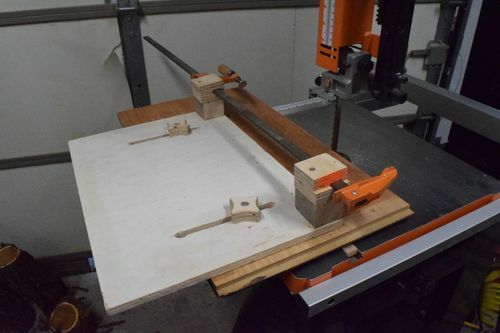 If you have seen my projects I built a few add ons for milling on my little saw. I believe the limits are the blade sizes. 5/8ths is the largest blade that should be used on my saw. Possibly the trunions are affecting your table? I advocate the lazy man theory. LOL! No, I hemmed and hawed about the about the trunnion upgrade but opted for the basic one. I occasionally look at getting the upgrade but frankly, I’ve not had any trouble with the trunnion. It is actually cheaper to buy the basic model and add the cast iron trunnion yourself than buy the cheapest model that comes with the upgraded trunnion. I cobbled together a quick and dirty jig for sawing small logs into lumber. It is a lot of work but I’ve gotten some pretty nice hickory, live oak and silver maple pieces that way. Yesterday I cut a 11” diameter pecan log up and today, I cut a small piece of bois d’arc which is really beautiful. I’ve been using a 3/4” timberwolf blade designed for green wood but I think I need to see if I can sharpen it. It still works okay for hard woods but with softer green woods it has started leaving lots of fuzzy fibers. Have you considered carbide blades ? Matt Krenow (sp?) my friend who’s doing the big bandsaw build from scratch to mill his logs says they are expensive but outlast other blades in the long run. I’ve looked at them but usually get sticker shock compared to the Timberwolf bimetal blades. I don’t do enough milling to justify the carbide blade but one of these days I may splurg. This is my log milling jig. Quick and dirty. Since I don’t have infeed or outfeed support, I have to keep the length of the logs under about 2.5-3 feet unless I have a friend there to help me. My first mill looked more like your log milling jig, though much cruder, where I would attach the log to an upright with lag bolts. This one is a lot easier to use. I put graduated markings on mine to keep the slices in approximate dimensions for further milling. The other thing that comes to mind when looking at yours and thinking about mine is possibly adding a guide slot for the holder to keep it aligned and make it more efficient? What is the largest inch size that you’ve used? The problems with the graduations and aligning idea is that the logs often have weird bumps, thicker bark in one spot or knots or might even be a little curved so you have to be able adjust the front and back independently. I usually just use a ruler to measure how far the log protrudes past the base of the jig to set the width of the next cut.